Amanda Gentry - Maverick Realty Inc.
Amanda Gentry grew up in small-town Hereford, Texas – the Beef Capital of the World. She graduated with honors from Texas Tech University with a Bachelor’s Degree in Public Relations and moved to Livingston to marry her husband, a Montana native, who is a local home builder. 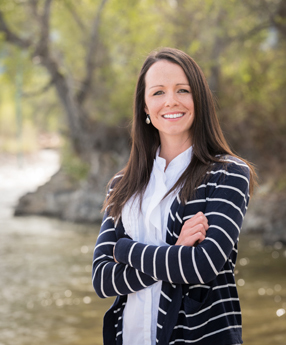 She immediately fell in love with Livingston’s beauty, character and the passion for life harbored within those who call Park County home. Amanda loves to interact with people and finds the real estate market fascinating. As a fresh face in the local real estate world, she presents a passion for excellence and desire to help make each real estate transaction stress-free and enjoyable! Amanda believes that every successful relationship is based on open, honest communication and prides herself on being an intuitive listener. Family is an important part of Amanda’s life, and she is often spotted with her children. Her on-the-go attitude keeps her active and busy. With her family, she relishes outdoor time, whether it is spent fishing, hiking, camping, or skiing. Amanda is a member of the National Association of Realtors, Montana Association of Realtors, Park County Board of Realtors and the Southwest Montana Multiple Listing Service.